The meeting is going to be the last in a series of meetings organized by the COST Action TO-BE (for Towards Oxide-Based Electronics). It aims to network researchers working in the field of the science and technology of transition-metal oxides and, to help them sharing their expertise, defining future strategies, and pursuing jointly funding opportunities. Participation at the meeting is open to scientists, both from the public research sector and from the private sector. It is NOT restricted to the members of the Action. Non-EU participants are also very welcome to attend. One of the actions undertaken by TO-BE is to promote building a Roadmap “Towards Oxide Electronics” that we expect releasing early 2018. The forthcoming TO-BE Spring Meeting would be the opportunity for contributors to present their views on different aspects of oxide electronics. The meeting will feature invited presentations delivered by contributors to the Roadmap, as well as flash and poster contributions. Submission of abstracts will be open on 1st December 2017. Please submit your work by 1st January 2018. 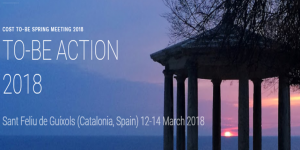 Finally, just after the COST TO-BE Spring Meeting 2018, the COST organized school on “Oxide-based Electronic Technologies” (15th-17th March) will be held at the same place (Hotel Eden Roc, Sant Feliu de Guíxols). Information will be posted soon. Josep Fontcuberta (07/02/2017) has been selected member of this Committee uncharged of promoting and organizing Courses and Tutorials. Symposium 2: Dielectrics, ferroelectrics and multiferroics.